Disability Blog Carnival #66 is up NOW! Terri at Barriers, Bridges, and Books gives us a collection of links around the theme of "Story"--go have a page through some stories and thoughts on telling stories about disability. The June carnival host is Dave Hingsburger of "Rolling around in my Head," and he has an original plan for his edition... I'll let him explain it, but do stay tuned, it's an interesting idea! The New York Public Library is marking the 115th anniversary of the founding of the Talking Book and Braille Service in the US and in New York City. It started in 1895 with 57 braille books, a free circulating library set up by a blind man, Richard Randall Ferry (1839-1906). Ferry had been a prosperous hat manufacturer before becoming blind in 1891; he had the resources and the drive to get something like this started. By the time of Ferry's death (according to his obituary) there were 10,000 volumes. In 1909, Ferry's assistant on the project, and one of the library's trustees, educator Clara A. Williams, wrote a plea in the New York Times, defending New York Point System against other braille formats. Her letter points to the state of flux such efforts faced just a century ago: "It seems a dreadful thing to me, for those living in New York State, and New York City, to allow any persons to come in from other States with a system of print which can be proved to be inferior, and tell us what we should do in our public schools, &c.... Miss Keller is certainly a wonderful woman, but she would, it seems to me, be biased in favor of any type for which her friends stood and it would be most natural for her to take the stand chosen by her teacher..." There were also concerns about whether the library would include a Bible (when "nearly every reader at the library has been presented with a Bible and has it in his own home"). The collection became part of the NYPL in 1903, and expanded over the years, in size, in format, and services offered. The technological history of recordings in the twentieth century is reflected in how audio books were prepared for blind readers over the years: hard discs, flexible discs, cassettes, and digital files have all taken their turn, in tandem with the devices required to play them. The Society for Disability Studies' annual conference, "Disability in the Geo-Political Imagination," kicks off Wednesday, June 2, on the campus of Temple University in Philadelphia, Pennsylvania. This year's will be the largest SDS conference ever, with a day-long inclusive education preconference on June 2, and five concurrent streams of papers, as well as a film festival in a dedicated theater, running Thursday, June 3 through Saturday, June 5. The conference kick-off is not to be missed: Wednesday evening's gala conference kickoff, to be held in Temple University's beautifully restored Baptist Temple (photoset), featuring performance, comedy and tributes dedicated to the life and career of Teddy Pendergrass, a Philadelphia resident who, during his lifetime, fought for the rights of all people, including people with disabilities. The rest of the conference talks and events will be held at Temple University's recently renovated Gittis Student Center (photo). The conference will close, according to long-standing tradition, with the celebrated SDS Dance, featured in Simi Linton's book My Body Politic (University of Michigan Press, 2007) - Amazon - and Sharon Snyder and David Mitchell's Cultural Locations of Disability (University of Chicago Press, 2006) - Amazon. There are number of options for conference registration available on the SDS website, including a special pass for the film program. While the Society has long been a mecca of scholars, activists and artists, this year's conference promises to push the envelope and recognize the contributions of Philadelphia and the midAtlantic region to the modern disability rights movement. Don't miss this opportunity to participate, celebrate, and rebuild disability community spirit. Those who want to follow conference developments can use the official hashtag #2010sds and the SDS Conference 2010 Discussion group on Facebook. Go to Twitter Search and enter #2010sds (you do not need a twitter account to use this function). I will also be updating my own twitter account @mdorn and my flickr photostream with information, gossip and other juicy bits from the conference. Born on this date in 1881, woodcarver John Louis Clarke, aka "Cutapuis." He was born in Highwood, Montana Territory, to Blackfoot parents (one of his grandparents was Scottish). The family was devastated in 1883, when five sons died from scarlet fever; the sixth son, John, age 2, survived with deafness; he did not learn to speak after that. He attended schools for Indian and deaf children in North Dakota, Montana, and Wisconsin. In Wisconsin, he began working at a factory that made carved church altars. 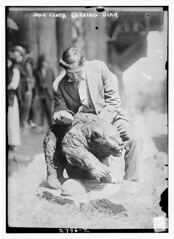 He opened his own carving studio in 1913, and had his first show in Helena in 1916. Clarke's highly detailed carvings of animals were exhibited widely and popular with buyers. Clarke's wife Mamie acted as his agent until she died in 1947, when their daughter Joyce took over that role so Clarke could concentrate on his carving. The story goes that he had his carving tools with him in the hospital room when he died at 89. BADD: "It will be interesting." Coming in a bit late for our fifth straight appearance in the Blogging Against Disablism Day swarm. Sunny Saturdays and blogging don't go together in my universe! And this will be briefer than our past entries, too. (Past BADD entries: 2009, 2008, 2007, 2006) Go to Goldfish's complete compendium of links to BADD posts for some much meatier fare. "If this activation resulted in a living haploid, what would it be like? Probably small, female, infertile. The brain? The body? What right had I to create this entity? I knew it could never be normal, but could it be happy? Could it love? Could it be loved? By me? No doubt the thing could be stopped... somehow.... 'No,' I said, 'I shall let it develop. It will be interesting.'" --the newly-expecting Mary, narrating character in Naomi Mitchison's Memoirs of a Spacewoman (1962). For mid-20c. science fiction, Memoirs of a Spacewoman seems to have a refreshing lack of disablism, an unusual openness to disability being an everyday part of the far future. Mary is also that rare mother character that's neither tragic nor hovering nor heroic--Viola (the "haploid") is one of Mary's several children, and when she worries about Viola it's usually for specific reasons, not a generalized "poor baby" attitude. Mary's professional work, studying modes of communicating among non-humanoid life on distant planets, requires her to be especially inclusive in her understanding of differences (across a range much vaster than present-day humans are ever asked to accommodate). And there's some indication that her traveling schedule gives her somewhat flexible expectations about how her kids will grow and change. But one doesn't get the sense that Mitchison means us to see Mary's love and respect for Viola as very unusual for their future world. I don't read much science fiction these days, but books like this make me think I should go back and re-read some of the short stories from the 1950s and 1960s that I read when I was a kid (in the 1970s and 1980s--I was buying old paperbacks at library sales, thus the lag). What might I have absorbed from those stories, about disability, about normality, about the future and who belongs where? Is the Mitchison novel unusual for its genre and era, or am I presuming too much? Happily, I've discovered that many pre-1963 SF stories are available free, in audio format, from Librivox. So I'm downloading away, grabbing the ones with titles that grab my attention, or the ones with women writers, just to see what I missed or forgot the first time. Gavin Miller, "Animals, Empathy, and Care in Naomi Mitchison's Memoirs of a Spacewoman," Science Fiction Studies 35(2)(2008).